FRESNO – There is nothing more important than your identity. Sensitive personal information in the wrong hands can ruin your credit or your bank account. And it all goes to show nobody can be too careful with personnel documents complete with full names and social security numbers. Offices all over have piles and file folder boxes filled with years of documents with nowhere to put them. 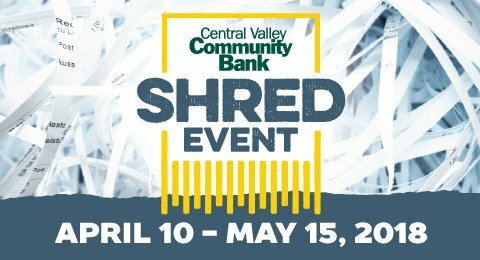 Thankfully, Central Valley Community Bank (CVCB) locations are inviting communities out to take advantage of their free shred day. Beginning yesterday, April 10 and ending next month, May 15, CVCB partner Pacific Shredding will visit up to 20 branches throughout the San Joaquin Valley and Greater Sacramento Region. Bank customers, businesses and the community are invited to attend any of the 20 Document Shredding events for the opportunity to shred confidential files safely, securely and free of charge (up to four banker boxes per person or business and up to shredding truck capacity). Boxes above the limit may be taken to a Pacific Shredding business location and shred for a fee. Participants are asked to bring paper documents only, and to remove binders, metal binder clips and other items in advance of visiting a Document Shredding event. Empty boxes will be returned for personal recycling. Understanding how to safely manage both digital and hard copy records has become a complex process for the American public. A recent Identity Fraud Report released by Javelin Strategy & Research earlier this year showed that 16.7 million Americans were affected by identity theft in 2017, an 8% increase from 2016. To counter this problem, Central Valley Community Bank offers educational tools including its Financial Health Club, an online resource center on their web site where the public can easily find the personal and business information they need to keep their finances strong, smooth and most importantly, safe. Educational resources include how to safeguard sensitive data, fraud prevention tips and what to do if you become a victim of identity theft or cybercrime. Central Valley Community Bank recommends shredding important documents regularly as one easy step to help prevent becoming a victim of identity theft and fraud. In addition to providing helpful resources on its web site at www.cvcb.com and in branches, the Bank offers a personal checking account with identity protection features, and recommends reviewing Identity Protection Insurance options for businesses as a proactive measure for customers and the public. Document Shredding events will take place from 9 a.m. to 12 p.m., unless otherwise noted. Additional information can be found on the Bank’s web site at www.cvcb.com/shredding, or can be referenced on the following page by region and county.